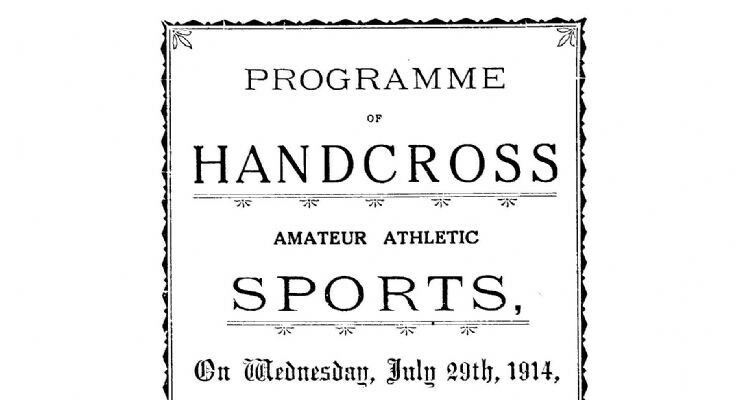 Sports Days in Handcross were prestigious events by all accounts. The 1d programme was professional printed and listed some 35 of the great and good of the Parish as patrons, plus a total of 31 officials. Included in the 22 competitive events were some which were fairly obscure such as the 100 yards Biscuit Race, the Potato Race, and Hat Trimming! A glimpse of Tilting the Bucket can be viewed at 2.00 in a video on picture #1814. The prizes handed out to the successful competitors were an eclectic assortment including 6 walking sticks for the Novelty Football Match, a collar box for the 220 Yards Flat Race for Boys under 16, and for the Obstacle Race for Boys under 16: 1st Shaving set, 2nd Military brushes, 3rd Walking stick. I bet they were thrilled! It is interesting that many of the events were handicapped in that younger competitors started the race at varying distances in advance of the older competitors. At least, I assume the distances were calculated from their ages and not their ability! For example, in the mile race 12-year-old Archibald Quick started 200 yards in front of the scratch runner. Or was that his father, 43-year-old Alfred Quick? Following the sporting events there was a display by the Slaugham Fire Brigade. Roger Ray wrote about the brigade in his book "Around Old Slaugham" and a copy can be seen by clicking on Large Version. A photograph of the former brigade headquarters can be seen at picture #444. Select Open Document to view the complete programme of events..